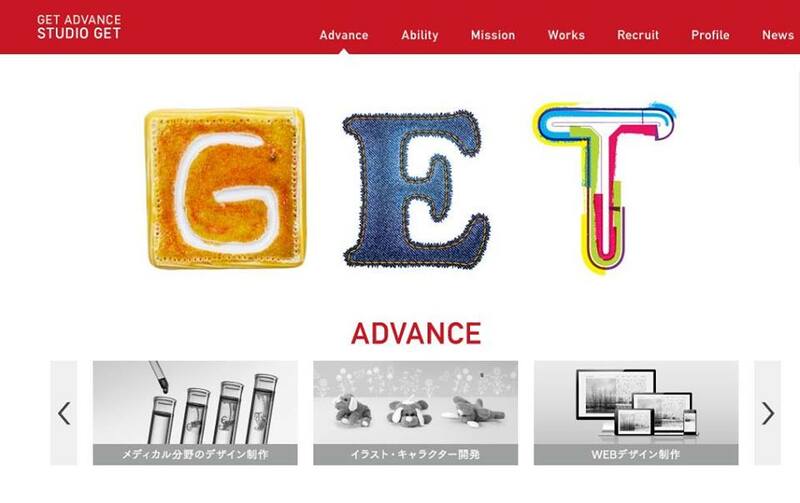 Top page > List of companies > STUDIO GET CO., LTD. Evolve along with the change of time and era. Having the ability to keep up with the newest trend in this rapid changing advertising media environment, and able to add additional values to the needs of the clients. This is what we aim for as the “GET ADVANCE”. With such spirit in our heart, we are proud of ourselves as professional media workers, and have always aiming for making better quality and creative productions. We always keep ourselves on alert by the changes of the media environment in order to create a production that is on the edge of the trend. <br>Starting from major scale collaborate sites to campaign pages as well as mobile sites etc. We provide web designs with precise communication demands by taking both design and information organization into consideration. <br> Characteristics: <br>1 We start our designing process with discussions regarding themes and the goals of a product. We do not start the production until we have reached the agreement about the image and the direction of a product with our client. And we share the information with people involved along the process. We are a trustworthy partner when it comes to designing.<br>2 One of our strengths is to provide an informational approach design which is easy to understand and easy to use to the users.<br>3 We make production that is high quality and with precise target information. Dai Nippon Printing Co., Ltd.<br>ＤＮＰCommunication Design <br>Dentsu Inc.<br>Dantsu Tech Inc.<br>Dentsu _On Demand Inc.<br>DSH Co., Ltd.<br>HAKUHODO Inc.<br>HAKUHODO Products Inc.<br>HAKUHODO Medical Inc. <br>JR East Japan Project <br>ORICOM CO., LTD.<br>Tokyu Agency Inc.<br>PHARMA International Inc.<br>KYOWA KIKAKU Co., Ltd.<br>BIGLOBE Inc.<br>FUJIFILM Imaging Systems Co., Ltd.<br>ALPINE Japan<br>Targis K.K. <br>SAATCHI AND SAATCHI WELLNESS<br>Medicals Co., Ltd.<br>Interscience Co., Ltd.